Cut 350 g rhubarb into bite-size pieces, then put them in a frying pan with 50 g sugar and warm through just until the sugar dissolves. Immediately tip the rhubarb into a bowl with the juices and leave to cool. Preheat the oven to 160 C. Roll out 350 g sweet short crust pastry quite thinly and use to line your tin. Line with greaseproof paper and baking beans and bake for about 20 min until the pastry is pale golden and no longer raw. Beat together 1 egg and 1 egg yolk, 1 tsp vanilla extract, 50 g sugar and 1 tbsp flour. Gradually whisk in 285 ml cream with any juice from the rhubarb (you should have a tablespoonful or two). Now spoon the rhubarb into the prepared pastry case and pour the cream mixture over. Turn the oven temperature up to 180 C and bake for about 20 min, or until the custard is very lightly set and there is a thin skin on the top. If you have any rhubarb and custard left, you can spoon it in ovenproof dishes and put it in the oven together with the pie, it makes for an excellent dessert without the pastry as well! Or use it for a rhubarb and custard cake. Mix together 50 g melted butter, 50 g light brown sugar, 50 g porridge oats and 1/2 tsp ground ginger. Spoon evenly over the pie. Return it to the oven for a further 15 min or until the crumble is golden and the custard set with just a little wobble. The top of the pie may have risen and cracked when you take it from the oven but don’t worry as it will settle back again on cooling. Enjoy while still warm. Use up left-over rhubarb in a rhubarb and date chutney, rhubarb and vodka jellies or rhubarb crumble muffins. If you have pastry left, you can freeze it or go for strawberry tarts. First, roast the rhubarb: heat the oven to 180 C. Rinse 400 g rhubarb and shake off excess water. Trim the ends, then cut into little-finger-size pieces. Put in a shallow dish or a baking tray, tip over 50 g sugar, toss together, then shuffle rhubarb so it’s in a single layer. Cover with foil, then roast for 15 min. Remove the foil, give everything a little shake, roast for 5 min more or until tender and the juices are syrupy. Carefully drain off the juices and let the rhubarb cool. 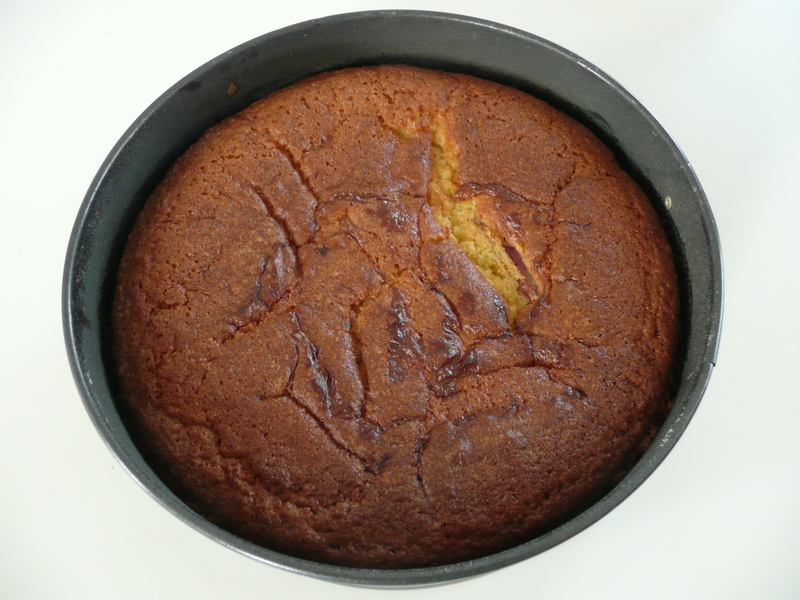 Butter and line a 23cm loose-bottomed or springform cake tin. Heat the oven to 160 C. Put all but 3 tbsp of 150 ml ready-made custard (if you are not in a custard country, you can use 50 ml vanilla pudding diluted with 100 ml milk) in a bowl. Beat it together with 250 g softened butter, 250 g self-raising flour, 1/2 tsp baking powder, 4 eggs, 1 tsp vanilla extract and 250 g golden caster sugar until creamy and smooth. Spoon one-third of the mix into the tin, add some of the rhubarb, then dot with one-third more cake mix and spread it out as well as you can. Top with some more rhubarb, then spoon over the remaining cake mix, leaving it in rough mounds and dips rather than being too neat about it. Scatter the rest of the rhubarb over the batter, then dot the remaining custard over. Bake for 40 mins until risen and golden, then cover with foil and bake for 15-20 mins more. It’s ready when a skewer inserted into the middle comes out clean. Cool in the tin. Enjoy! 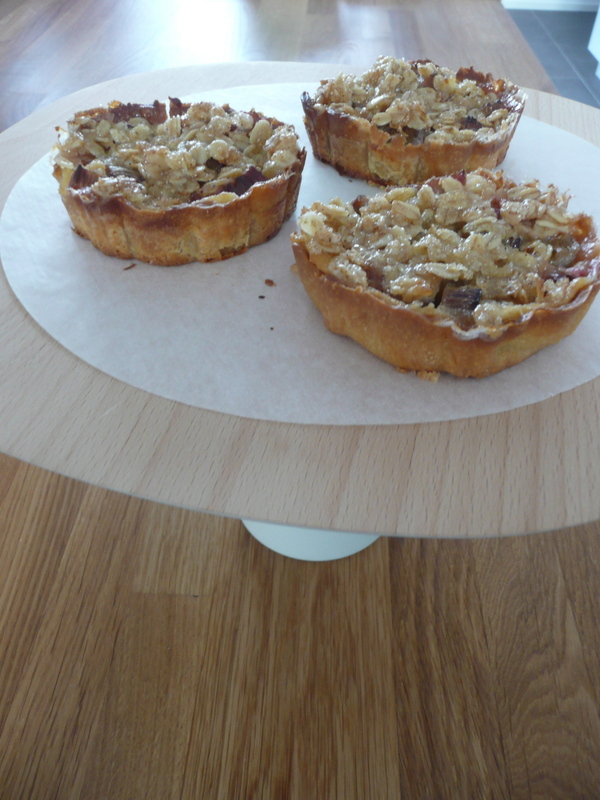 Use up any leftover rhubarb in rhubarb crumble muffins or rhubarb and vodka jellies.